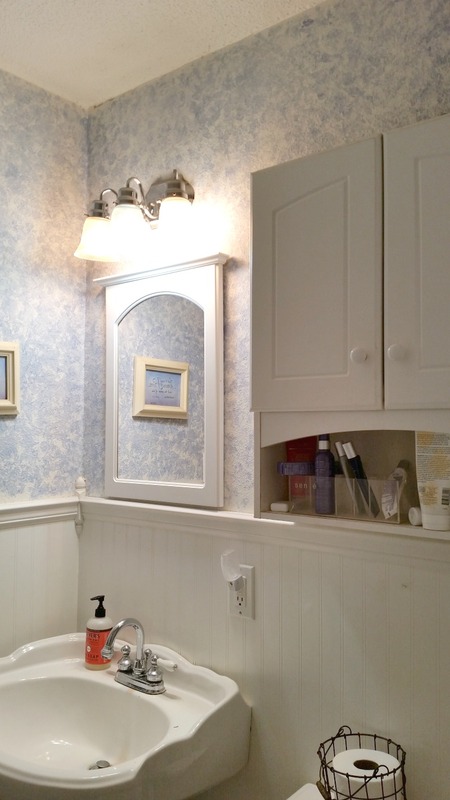 When Terri emailed me photos of her bathroom, she mentioned wanting to replace the light fixture, update the mirror, and change out the pedestal sink. She also mentioned needing more storage in this small space. I would like to get a bronze oil light fixture to replace fixture above the mirror. I’d like to get rid of the cabinet above the stool but we don’t have anyplace to put tooth brushes, make up etc. I’d love to replace the sink but then what do you put in its place. Updated light fixture & mirror: I chose this bronzed fixture and mirror combination in an effort to give the space an elegant, farmhouse feel. Both are affordable options and each one makes a statement in its own right. I think they work really well together. New vanity: There are so many vanity options available online now, it’s actually kind of crazy. But I chose this one in a beautiful antique gray finish for a few specific reasons. 1) I love the arched doors, I think they give this cabinet a unique look. 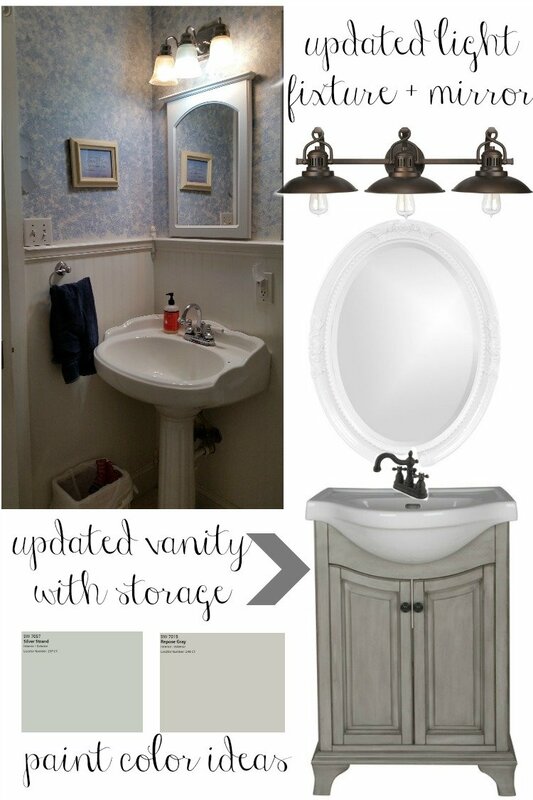 2) This vanity will give Terri lots of storage. 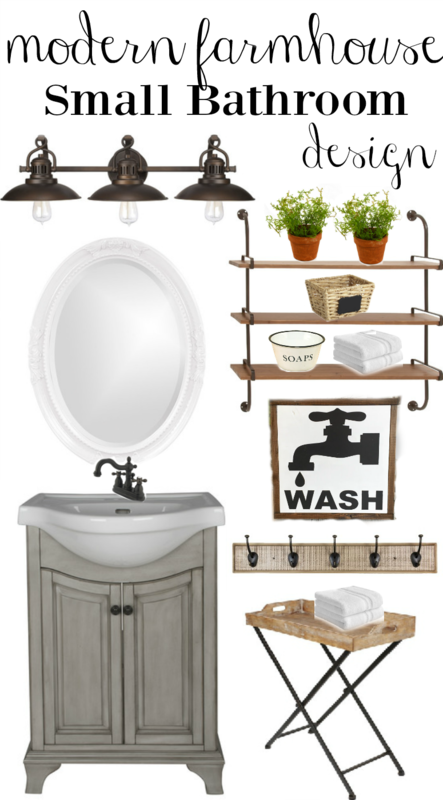 3) The style/look of this sink reminds me of a farmhouse sink, which is awesome. 4) Great vanity for the price and the reviews are all wonderful. I chose this Victorian style faucet to go along with it. 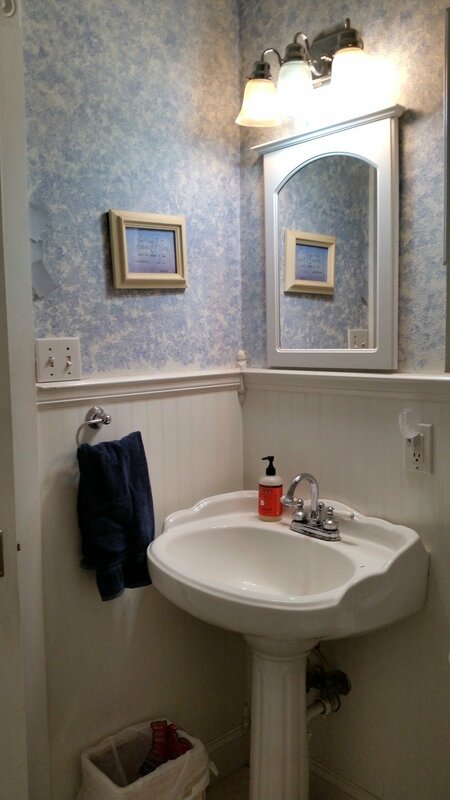 Paint color ideas: Terri mentioned that she might paint this bathroom a light blue color, which I think would work well with the antique gray vanity. I’m suggesting two great color options, both of which have been seen in Fixer Upper many times: Silver Strand by Sherwin Williams and Repose Gray by Sherwin Williams. Remove Cabinet Above Toilet: Now on to the cabinet above the toilet. With the added storage in the new vanity, Terri won’t really need this cabinet anymore. She mentioned wanting to take it down, which will definitely help this room feel bigger and more open. However, instead of leaving that wall space empty, I think open shelving would work really well here. This will not only give the room more storage without feeling bulky, but it’s going to be a great spot to decorate and add a bit of charm to the room. I actually have an almost identical set of shelves in our bathroom and I love it. 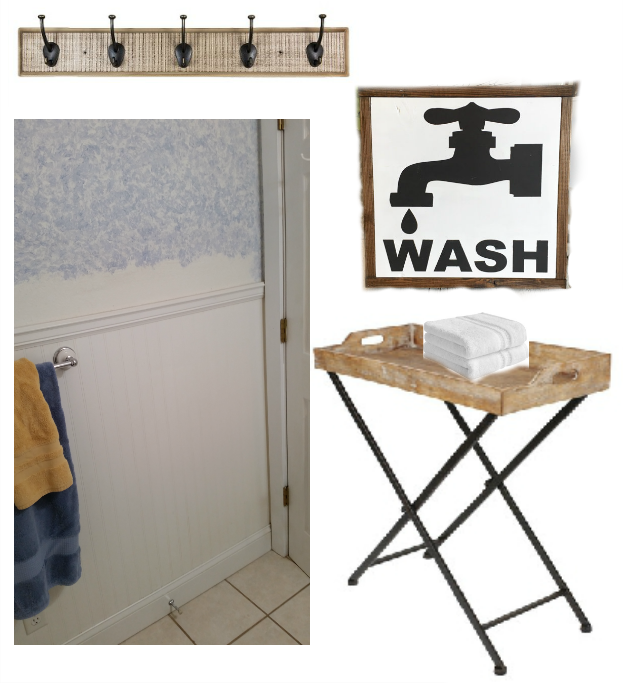 Decor & Extras: I selected a few accessories and decor for the empty wall space on the back side of the bathroom. This wooden tray table is perfect for a small bathroom because it’s easy to move around, it actually folds up, and it makes a great spot for extra towels or toiletries. From what I can tell it looks like Terri might not have the space for this tray table, but I wanted to include it just in case. 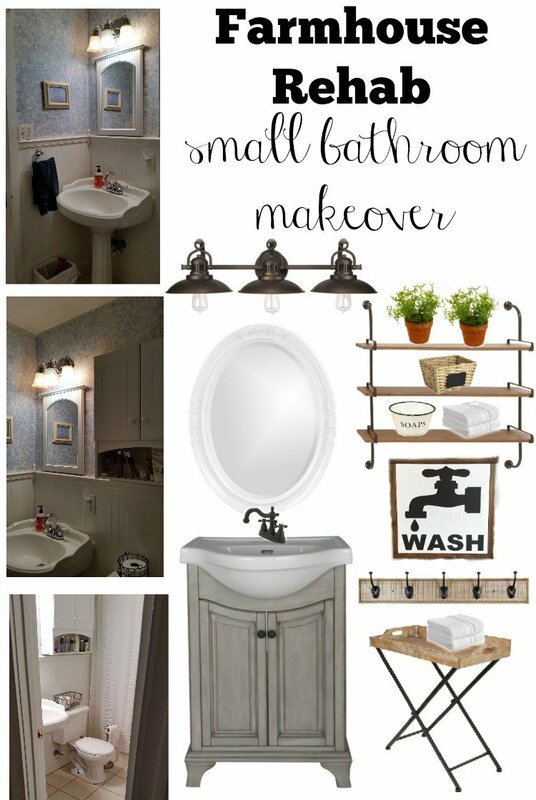 Terri really has a great little bathroom and I think it can become even better with a few key changes. Just a fresh coat of paint and the new vanity alone will make a big difference in this room. And even though it is small, there’s so much potential for this bathroom to make a big statement. I can’t wait to see what it looks like when Terri’s transformation is complete! I hope you all enjoyed today’s edition of Farmhouse Rehab. If you’d like to submit a room in your home for this series, just shoot me at email at [email protected] with FARMHOUSE REHAB in the subject line. Please include several good photos of the room and it’s also helpful if you mention the specific things you’re hoping to change. And please keep in mind, I am not a professional. These are just my personal opinions and recommendations. I spend a lot of time and effort working on these posts, but at the end of the day these are only my suggestions! Thank you all so much for stopping by the blog today. Big hugs from me to you. You guys are awesome! Love this! Great ideas and a wonderful idea to add this on a regular basis to your blog! Great ideas here!! 🙂 Love the things you chose. Spot on suggestions -hope she goes with them and sends you back pictures to post for us. Thanks Marilyn, I hope to see the finished bathroom too! I’ll definitely share it if that happens. This is great! 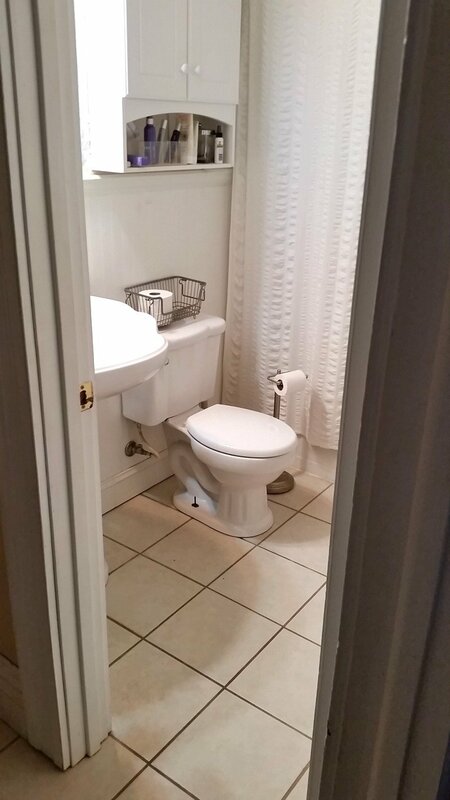 I may steal some of your ideas for our ugly half bath. ???? I love all of it! Great ideas, Sarah. I think Terri is right about wanting to paint the bathroom. If she goes with something light and airy, it will give the bathroom the illusion of being larger, too. 🙂 Love the vanity! I agree Julie! I hope we get to see how the bathroom turns out when Terri is finished! Hi, SARAH, The tips you gave here are really nice. 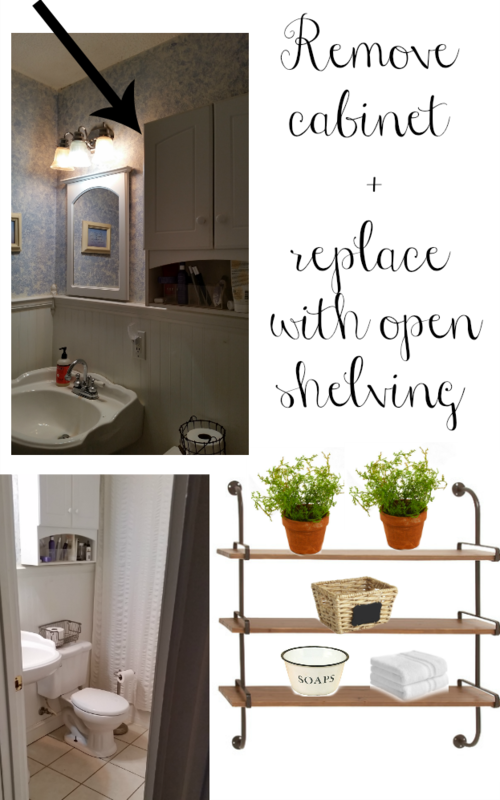 As I’m also planning to renovate my bathroom will keep your tips in my mind also and I’ll also remove my cabinet and replace that with an open shelve. Thank you for sharing great tips. Looking forward to more beautiful tips by you. Best wishes and Regards. Yes, SARAH. You are absolutely true. I also feel the same thing that it does not matter what is the size of the bathroom, whether it is small or large, because a small bathroom renovation can be a big project. The most important thing is when someone is going to rehabilitate his small bathroom, then he should first set his budget and keep the design theme in the mind, so that he can do his bathroom makeover in a well organized way. But if you think you can do it on your own, then I can tell that you may, but the result may not be so effective. I think it is better to hire a contractor, who will take your small bathroom from drab to fab. This is pretty awesome.I love your ideas. That lights above the mirror is really looking cool. You have done it beautifully.